We all do it. We put on a pair of shoes and look down at them and feel like the feet inside of them are entirely alien. That was the case with this pair of bowling shoes recently. It had less to do with the fact that they were bowling shoes. 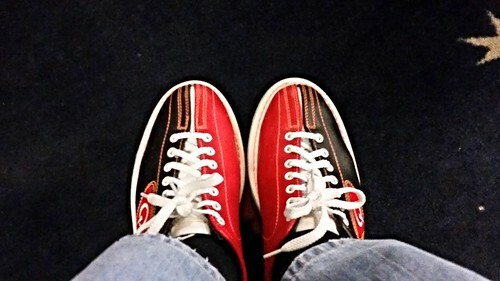 Not that I go bowling often, but I've worn them enough that I'm ok with the odd-colored and funky shoes. But these things felt like boats. They were my size, but the outsides of them felt out of proportion. In this case the white rime of these shoes were at least 1/4 inch thick, so rather than where a shoe typically ends, these went even further outward which felt strange to walk with. I wear minimalist shoes, thin soles, and slim frames and these were anything but that. Maybe that's what I can blame for my abysmal scores (yeah, that's why I was so horrible!). But even the design of these ones are a bit strange than what I've seen before. The black and red pattern is fine but the way the outer sides of the shoe don't actually meet in the middle but rather there is the extended tongue. It makes me wonder who designed them and what was their incentive in presenting them as such.